Male ducks are known as drakes and the females as ducks, and the infants as ducklings. There are more than 40 breeds of domestic duck, all of which are descended from either the Mallard or Muscovy duck. Domestic ducks typically live for between 10-15 years, although the world record is held by a Mallard Drake who lived to the ripe old age of 27 years. There are numerous breeds to choose from and your choice will be influenced by how many you want to keep, your experience and your preferences for meat or eggs. The Peking is a good choice for meat production, and has been used for developing other breeds intended for this use. The Muscovy is also good for meat production, and lay’s about 100 eggs a year. They are also good insect harvesters for your garden. If your preference is eggs over meat, breeds to be considered are the three varieties of the Orpington, or the Campbell, which also has three breeds. In the event you are primarily interested in keeping ducks as pets, the smaller Call breeds which were bred to lure wild ducks into traps are probably most suitable. Their small size and nature makes them appealing and they are easy for children to handle. They can, however, be relatively noisy. This is Jemima Puddle-duck! Aylesbury ducks only come in a pure snow-white colour. They are a very large breed duck, have short legs and heavyset bodies with pink bills and orange webs. Those with orange bills and webs are crossbred with another duck breed. Aylesbury ducks lay 35-100 large white eggs per year, starting from November. Females weigh about 4.1 to 5 kg and drakes weigh 4.5 to 5.4 kg. They have a loud quack and need more space due to their size so you would need a larger garden for this heavy breed. They are ideal as garden ducks, because they seldom fly - they are too heavy to lift off the ground. This is a bantam breed of duck with stunning, beetle green glossy plumage. This breed is ideal if you have a small garden, but keep their wings clipped as they may fly off when spooked. They lay 40 to 100 eggs a year. Drakes weigh 900g and ducks weigh 700 - 800g. Campbell ducks were bred to be friendly garden ducks. Mrs Adelle Campbell, from Gloucestershire, introduced Campbell ducks in 1901. She wanted to create a breed that laid tasty eggs, would not fly away, did not get broody and were calm and friendly like chickens. They were bred from Runner ducks, Mallard and the Rouen. Campbell ducks are a medium sized breed. Drakes weigh up to 3kg and females from 2kg to 2.5kg. They lay approximately 300 to 350 white eggs a year. Choose from khaki Campbell ducks, white with orange bills and webs, apricot, dark, blue, magpie and fawn colours. They are designed to live alongside chickens and are happy to splash around in a washing up bowl. These great foragers eat slugs, snails and worms. Calls ducks descend from mallards and originate from Holland. They were bred to call wild ducks to traps for hunters. They make great garden pets, because they are tiny and do not cause as much damage to the garden as larger duck breeds. They are lively, friendly, and do not need as much space as medium breeds. Call ducks are small bodied with short bills. They have a high-pitched call and can be very noisy, therefore only choose call ducks if you do not have close neighbours and don't mind constant quacking. Some call duck owners say that their call ducks are not as noisy as their chickens. Call ducks need small bowls to swim in. The drake weighs approximately 550 to 700g and the duck is only about 450 to 600g. Call ducks lay about 100 small eggs per year. Choose from mallard, mallard pied or white, yellow belly, dusky, blue fawn, blue silver, apricot silver, chocolate, magpie and bibbed, blue apricot and khaki colours. Miniature Appleyard ducks are an attractive garden duck due to their small size and their pretty silver and brown flecked plumage. They are about the same size as a call duck, but lay 60 to 160 eggs per year. These friendly ducks have great characters and are easy to tame. Drakes weigh 1.5 kg and ducks weigh only 1.1 kg. This heavy breed duck originated from China in the 1800s and then spread throughout the world. Pekins are calm, friendly ducks and make great pets for the larger garden. They fly like a large fowl chicken - up and straight down again! They have a waddling walk and are quite chatty. They are smaller and chubbier than Indian runner ducks, but have a similar upright stance. Their deep orange bills, orange legs, webs and white feathers make them popular pets. Plumage is soft and fluffy with a slight yellow tinge. Pekins are busy ducks and like to dabble and explore. Females lay 80 to 140 white eggs a year. Ducks weigh 4.1 kg and females weigh 3.6 kg. As their feathering is not as tight as other breeds, they need more frequent changes of bedding, less mud and regular mite checks. Indian runner ducks originate from the East Indies. They are an extremely popular garden breed, because they are tame and comical to watch. Runners would be happy with a bucket to dunk in their heads. They look like wine bottles or penguins and were originally called penguin ducks. Due to their upright stance, they are known as wine bottle ducks. They need a taller duck house due to their height. Runner ducks are good egg layers and produce about 200 eggs a year. They are best kept in pairs or trios. They are a medium sized duck; Drakes weigh 2 to 2.3kg and ducks weigh in at 1.4 to 2kg. Choose from black, fawn, chocolate, apricot, trout, fawn, fawn and white, mallard, silver, white and blue. Ducks are very social animals and accordingly at least two should always be kept together. Several female ducks should be kept for every male in each holding, the ideal number of which will vary dependent on breed. The best breed to keep will vary dependent on whether your main reason for keeping them is either meat or eggs, or whether you want them primarily as domestic pets. Ducks need to be kept in a secure pen or house when you are not at home that will protect them from predators. To be secure, housing needs to have solid sheeting or welded mesh (with wire at least 1.2mm thick) on the roof, floor and walls. Provide as much space as possible for each duck. At a minimum provide at least 1.5 sq metres area per duck in their house or pen if they are to be confined in it during the day. For a night house provide at a minimum, at least 0.5 sq metres per duck. Duck housing should be out of the sun and should provide wind protection. Ducks don’t really like to be in direct sun. Metal housing in particular should be insulated or shaded to avoid it becoming dangerously hot inside (ducks can die from heat stress so precautions must be taken). Housing must also be well-ventilated. A simple three-sided shelter with a mesh base, front and door is suitable. The open side should face North, to get the Winter sun and avoid cold, wet Southerly winds. The duck house or pen should be easy to clean as ducks poo a lot. Rice hulls are an excellent pen surface for ducks as they are soft but last a long time and also drain very well. Rake the rice hulls over each day. Do not use bare concrete or pavers over more than one third of the pen floor or your ducks will likely develop sores on their soft feet. Inside the house, provide a ‘private’ spot for a nest (a sturdy cardboard box on its side, or an old lawnmower catcher will do). Keep the nest topped up with clean mulch, wood shavings or straw. Ducks often bury their eggs in the nest. Ducks don’t generally need a perch - they will sleep on the floor. Keep their food container inside the duck house under cover so it doesn’t get wet. Keep the water and food at least a metre apart to discourage them from dribbling water in their food. Ideally, put the water over an area that drains well. Sitting the water container over a drainage pit or platform wider than the water container and filled with smooth pebbles is ideal. Ducks love water and use about 1 litre of drinking water per duck per day. They need water to keep their eyes, bills, feet and feathers in good condition. The water should be deep enough for them to stick their whole head into and to wash their body. The water container needs to have a shallow edge so that the ducks can get out again easily if they happen to climb in. They love pools where they can climb in and splash. A kids pool (clam shell) or a tub about 20cm deep is perfect. Supervise access to swimming water until you are sure that the ducks can get in and out of the pool easily. Old baths are not ideal because they are slippery inside and ducks can find it hard to get out. Although ducks are usually great swimmers, they can still become waterlogged and drown. In the wild ducks are opportunistic eaters and will eat grass, aquatic plants, insects, seeds, fruit, fish, crustaceans and other types of food. In practice when keeping ducks domestically the staple food generally used is a duck feed, although this can be supplemented with other items. The duck feed will vary dependant on breed and age, although feeds will normally consist of wheat and maize, with soya bean meal and soya oil added in order to provide extra protein and energy. Minerals and vitamins are also added to protect against deficiencies. Ducks love to forage around a garden. They search in mulch and under plants for tasty grubs and worms. Ducks like to eat grass, so they will enjoy grazing on lawn and keeping the weeds down. You will need to fence them out of your vegetable garden or they may eat it all! Ducks do not dig (unlike chickens) but they will make little holes in soft or wet earth with their bills, ‘drilling’ for worms. Let the ducks in when you are digging in your veggie garden– they will have a wonderful time finding earthworms and other treats. Feather loss in ducks is often a sign of illness, although a duck that just loses feathers from the back of its head during the mating season is most likely just getting too much attention from the Drakes! Dull feathers are a sign a duck may not have access to water deep enough to submerge in and throw water over themselves. This will mean they are not able to spread the lubricating oil from their preening gland over their feathers. This should be attended to as this can have a bad effect on their health. Any awkwardness in their walk should be checked and dirty eyes or nostrils can be a sign they do not have access to deep enough water to dip their whole head and neck into. It is important ducks have this in order to be able to wash their eyes as they do not have tear ducts. Ducks kept in a clean environment and fed good food are generally very robust and hardy animals. Ducks rarely suffer from intestinal worms or mites (especially if they have regular swimming sessions) but they usually need to be wormed every 6 months with a poultry wormer. Talk to your veterinarian for advice about worming. Ducks can be a bit clumsy and prone to tripping over things, and are easily injured. Ducks kept on a rough or hard surface can develop foot ‘ulcers’. Swellings, sores on their feet or limping need attention from a vet. Never give mouldy food to ducks – mould spores can cause respiratory diseases or sudden toxic reactions in ducks. Keep their water clean – change drinking water every day. But don’t worry that they turn their new, clean water brown within minutes. Angel wing - Also known as slipped wing, crooked wing or dropped wing, this syndrome causes the wing feathers to grow in an abnormal pattern, with the last joint being twisted outwards and feathers pointing out instead of lying flush against the body. Angel wing is generally caused by feeding food too high in protein. There are various types of complete diets available for ducks with differing protein levels for different stages of their lives- make sure that you are feeding the most appropriate one. Bald spots - Bald spots (sometimes mistaken for mange) around the head and neck of your duck is often simply caused by mating roughly. Out of choice, ducks mate on water rather than on land, and you can minimise the potential for injury and infection during mating by giving your ducks constant access to their pond or swimming area, particularly during the breeding season. Beak problems - Spotting or discoloured patches on a duck's beak may be indicative of a fungal or bacterial infection. Seek advice from your vet, who may need to run some diagnostic tests. Lumps, bumps and rough areas on the beak are often caused by pecking, digging or rubbing the beak on hard ground, which can cause abrasions and injuries. Be aware of any areas your ducks have access to which may cause a problem, and see if you can address it. Occasionally, bumps and lumps on the beak may become infected, and need to be treated with an antibacterial preparation. Again, seek advice from your vet. Breathing problems- Wheezing, coughing, sneezing or choking all requires veterinary attention ASAP. A sudden change in the weather can be enough to cause pneumonia in ducks, and ducklings can get colds from exposure to water or air that is not warm enough. Coughing and wheezing can also be a warning sign of food caught in the oesophagus or a variety of other problems that, if caught and treated quickly enough, are totally curable. Bumble foot - A condition of the foot which presents with symptoms of swelling, redness and inflammation. 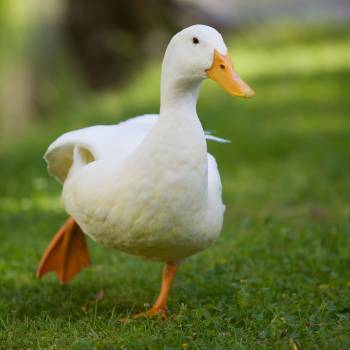 Seek veterinary advice if you suspect one of your ducks has any kind of foot infection or weakness of the legs. Eyes - Your ducks need to be able to immerse their whole head in water regularly, in order to clean and moisturise their eyes. Make sure clean water is available at all times. If your duck pond or dabbling area is particularly shallow, consider providing a deeper bucket of water for them to use for ducking and grooming. Leg injuries- Exposed wire flooring in your duck house is one of the worst culprits for damaging ducks feet. Make sure any wire flooring is covered up. Injuries can also occur to ducks when entering and exiting the water, so make sure a ramp is provided if necessary. Ducks do have a tendency to stand on one leg, sometimes when asleep, with the raised leg tucked up under their plumage. This is normal behaviour and not cause for concern. Living environment- In order for your ducks to thrive, clean and hygienic surroundings are vital. Clean out the coop or duck house on a daily basis, and put down fresh straw or bedding. Make sure food is stored in sealed airtight bins or containers that bugs and vermin cannot get into. Empty drinking water containers and replace drinking water with fresh water at least once a day. Make sure your duck's swimming pond is pest free and not stagnant. Moulting - Ducks moult every six months or so, in the spring and autumn. During the re-growth period, the wings especially can be tender to the touch, so try to avoid unnecessary handling. Poisons - Ducks can ingest poisons such as lead fishing weights, pesticides and chemicals. They are very sensitive to zinc, copper and lead. Try to make sure that your ducks' enclosure, pond and outdoor area are all free of any potential toxins. In the event of suspected poisoning, fast veterinary treatment can save lives. Never use pesticides around ponds or in the area where your duck enclosure and coop is. Do not use bleach or any other household cleaners around your ducks, or on any of their equipment. Stimulation- Ducks are social animals, and need to be kept with others of their kind. They also need attention from you as well- neglected ducks soon become depressed and lonely, and more prone to illnesses. Wing clipping - Most domestic breeds of ducks commonly kept as pets and for eggs do not need their wings clipped, as they have been bred in captivity for many years. A couple of varieties such as call ducks, however, sometimes have their wings clipped. Improper clipping can lead to bleeding and infection, so always make sure that only a veterinary professional performs wing clipping, should it be necessary. Wing damage - Sharp objects such as wiring sticking out of fences, or easily missed obstructions that are below our eye level can cause cuts and damage to your duck's wings- as can fighting and playing with other ducks. A lot of these problems can be prevented by giving your ducks plenty of space to move about, thereby avoiding contact with potentially injurious objects or scrapping over territory.